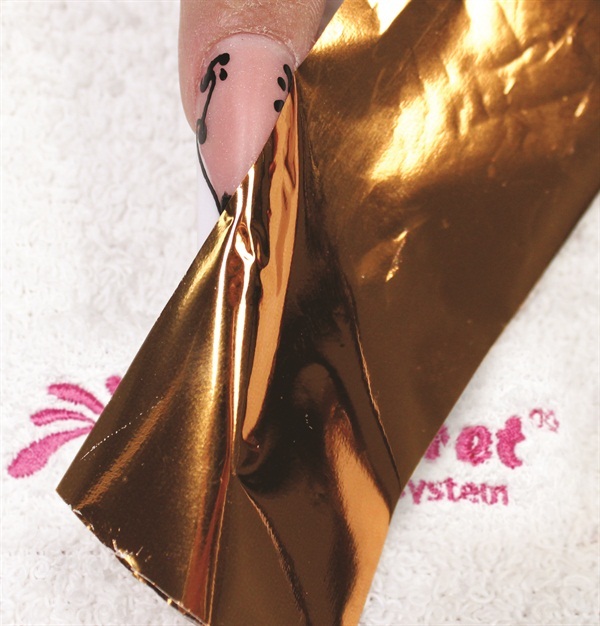 Learn how to use Mia Secret’s newest item, Nail Decoration Foil Paper to create sophisticated nail art designs. 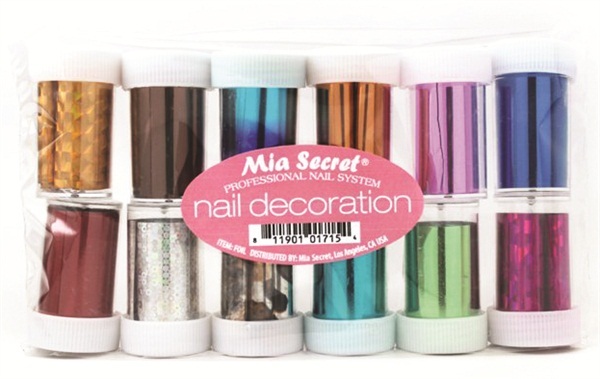 Mia Secret released its newest item, Nail Decoration Foil Paper, which is available in 24 different colors, patterns, and textures. 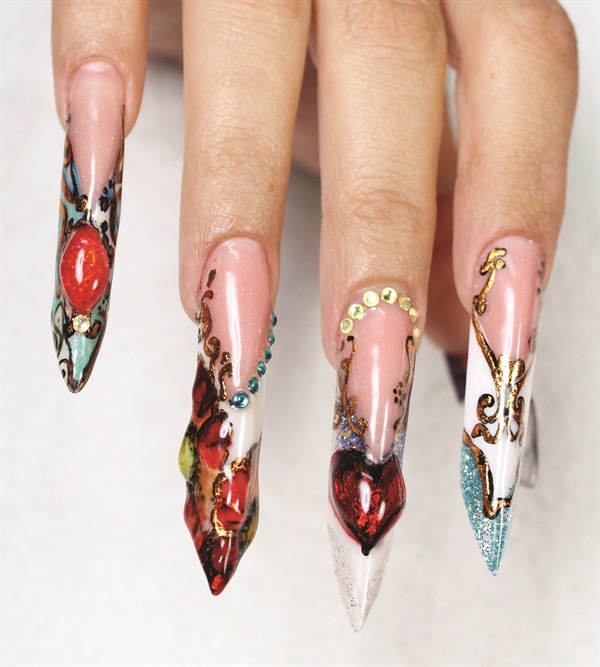 Here, international Mia Secret master nail technicians Viviana Cabezas, Andrea Rojas, and Eva Montelongo show how to use the foil in conjunction with gel and glue to create sophisticated nail art designs. The particular shade of copper foil used in this demonstration creates an antique look. 1. Prep the natural nail. Place the sculptural nail form and extend the nail plate into an almond shape with Mia Secret Cover Pink UV Gel. Cure for two minutes with a 36-watt UV Lamp or for 30 seconds with an LED light. 2. 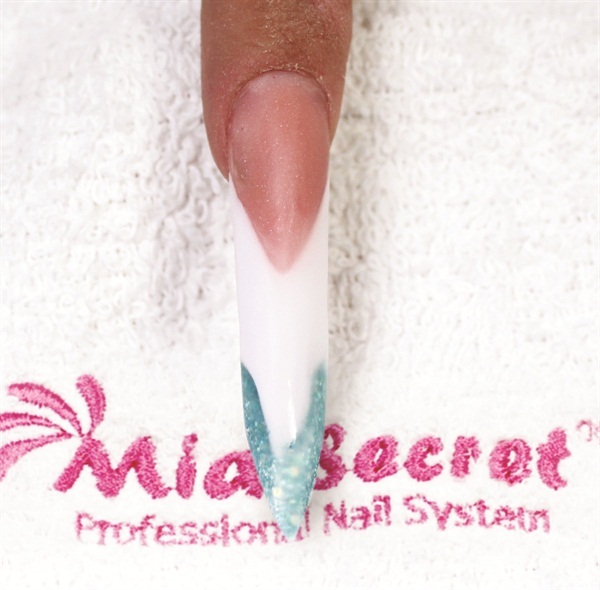 Continue extending the nail with white acrylic powder followed by colored acrylic powder in Caribe from Mia Secret’s Carnaval Nail Art Powder Collection. Apply a layer of Mia Secret UV Finish Gel. Cure for two minutes or 30 seconds. 3. Remove the form, file the nail, and remove any imperfections with a Mia Secret nail file. 4. 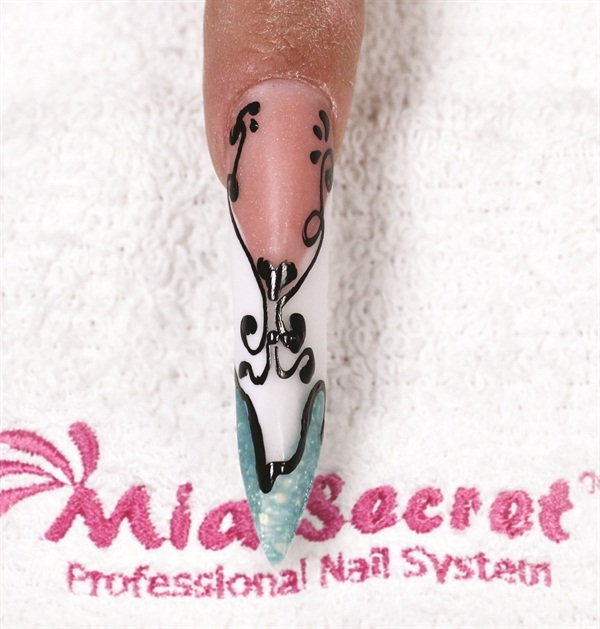 Draw a decorative pattern on the nail with the Mia Secret Black Nail Art Pen. Wait for the design to air dry completely. 5. Place about two drops of Mia Secret Eyelash Glue on a clean surface and recoat your decorative pattern with the glue using Mia Secret’s Nail Art Brush. Retrace the pattern with very fine lines for an uneven coat, which gives the final design an antique effect. Let it air dry for one minute. Once the glue feels sticky, press the foil paper on the glued surface, pressing down firmly and then pulling it off quickly. Make sure to apply the foil shiny side facing up. 6. Seal the nail art with Mia Secret UV Finish Gel and cure for two minutes or 30 seconds.